Well its that surreal time of the year again my friend Rodney Rigby is back again, second trip in 12 months this place just gets under your skin. It is fun on the boat every time Rodney’s friend George says Rodney we both spin round I say every time just call me skip and Rodney, Rodney but never seems to work. Well should be a bit more relaxed both have asked for small and jumpy so big rods are being left at home sods law big and I mean big shark at first wreck but no takers I have guys who would die for the shark we had yesterday but at Fish the Dream fishing holidays in the Florida Keys the anglers call the shots. Still a fun day wrecking Rodney had the royal run around with a sting ray and a fine cobia just big enough to keep and my wife curried me some last night fantastic. 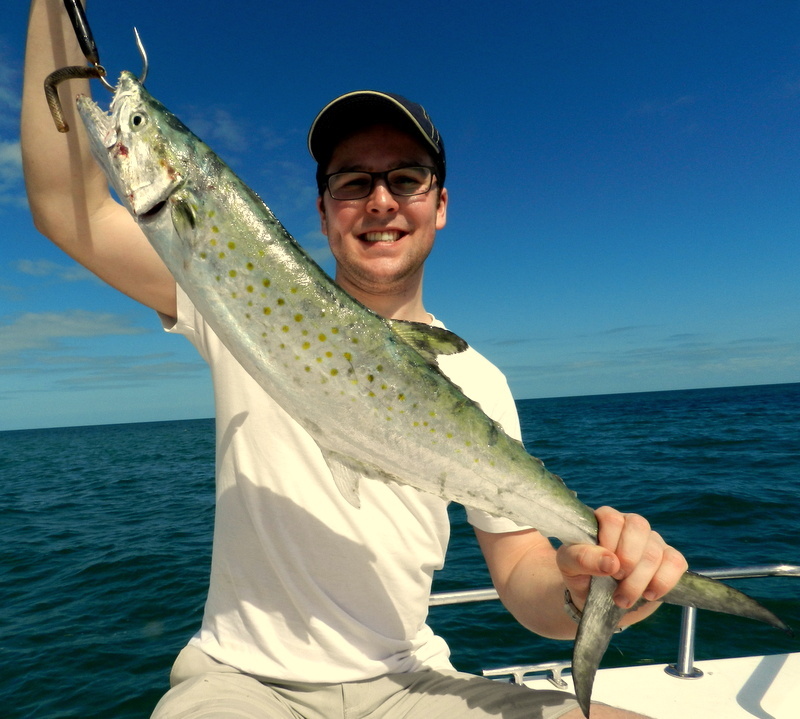 Laugh of the day was poor George who tried his heart out for one of the big barracuda then one late in the day took the cuda tube only to run straight into the main line and was off not before doing one final jump to show us all the lure in its mouth. Had a strange day yesterday on the tuna grounds a fair run out then when we got there no current strange for 26 miles out just about 1.5 mph less than half of the normal run and as they say no run no fun. We had just one tuna a big skipjack a fantastic fight but no good on the barbie. So quick stop on a offshore wreck on the way home to put smiles back on faces Rodney started off we a massive horse eye jack and on a light jig and in 112 ft water a battle for anyone. Then George joined the party and took care of the dinner order two fine yellow tail snapper as good as it gets on the plate. Still having fun with the Go Pro had a mass of snapper behind the boat put the camera on a float and sent it back through the fish very cool vid. 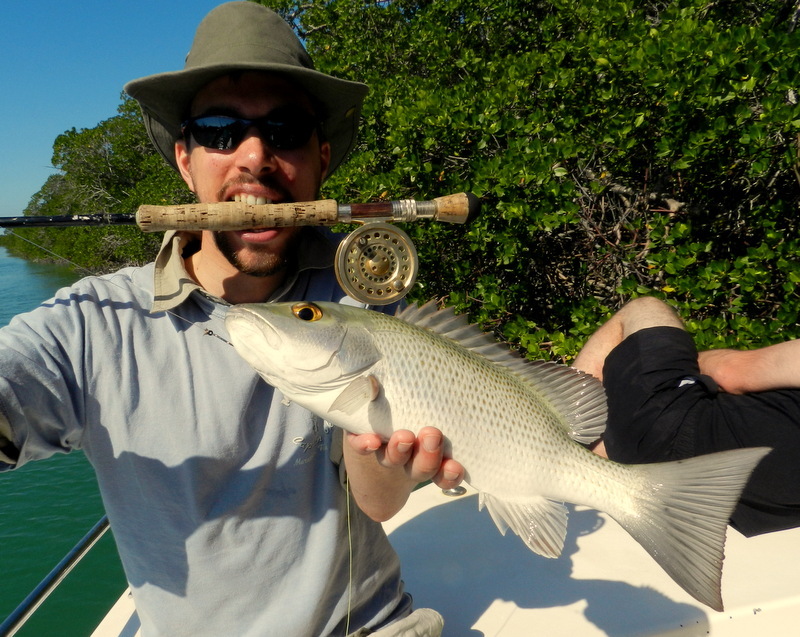 Well an other first at our fishing holidays in the Florida Keys two guys from Switzerland, it all started when young Alex and Ramon were planning a road trip in the south of the US which as some of you know has to end up in Key west. For two young guys they were packing a lot in from all the classic stops including driving a race car at 165 mph at the famous Daytona race track but very high on there bucket list was to catch a big fish in the Florida Keys. Well after an internet search they came up with Fish the Dream even an old ludites like me are more and more impressed with the power of the internet. 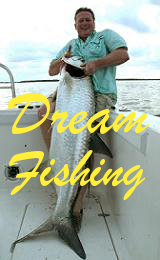 As a lot of you know we do big and with the help of sharks and goliath grouper we will put a serious bend in many a anglers rod so a deal was done and Alex and Ramon were coming to Fish the Dream for a few days. 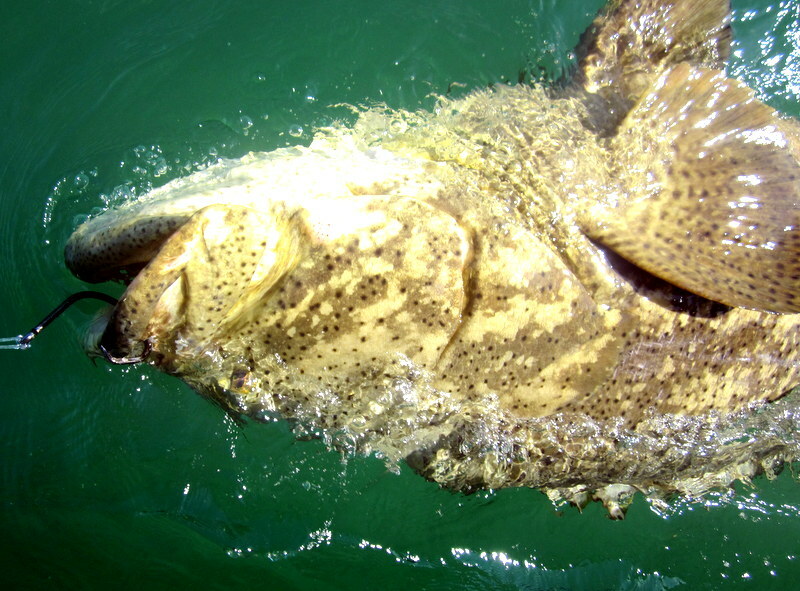 Have a look at the photos below and with shark near 200 lbs and grouper over 400 lbs I think I got the job done, the 22/0 hook scared them on the first grouper trip as did the 6 lb baits then the power of the fish just blew them away. So why Blinker Boys well it was on the first trip catching mackerel one of the guys looked up at all my rods we always take rods from 8 lb to 80 lb and said can I use the Blinker rod, a new one on me. Well he was asking could he use the spinning rod that had a metal spinner on it in Switzerland they call this a blinker bait as it flashes when you wind it in, kind of makes sense so from now on it is know as the blinker rod. On one day Alex made a fantastic video which I have left uncut as it shows the madness of blacktip shark fishing they know all the tricks under the anchor rope round the props and a final run when they look done. Top video thanks Alex and my blinker boys are welcome back any time. I am not sure if it is female pheromones or the Miss Ballantine effect with her 64 lb record salmon but lady anglers here on our fishing holidays in the Florida Keys do seem to do rather well. 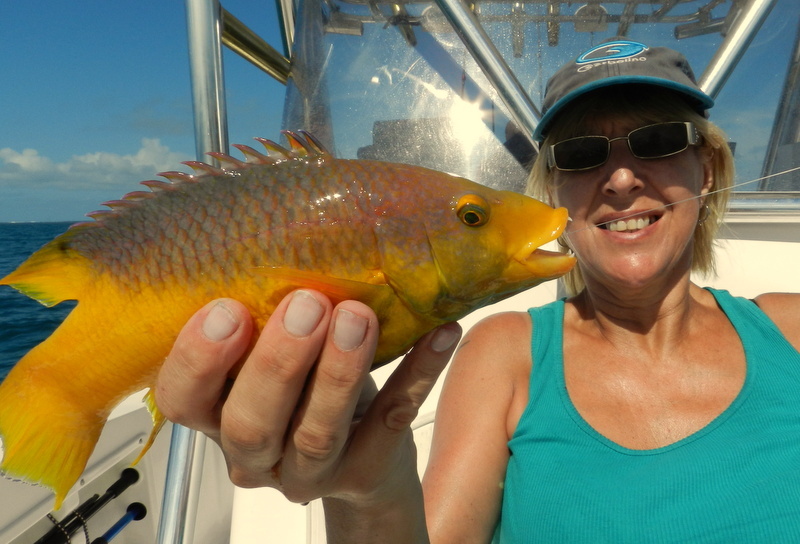 Last week was no exception and Carol who as only been fishing for about five years had a cracking week, not just the small stuff but giving the grouper and shark a taste of female power as well. As I said it all started when rather than stay at home when Paul went on his weekly fishing matches she decided to join him and I gather does rather well. So when Paul decided to travel abroad to fish there was no stopping Carol and as they say the rest is history. Even I was surprised the other day when at the goliath grouper wreck Carol said my turn and as you will see on the video no problem fish to the boat. The one thing that always brings a smile to my face with lady anglers on my boat they do tend to do what I tell them where how do I put guys tend to put there on spin on my instuctions, the classic is the drag settings more than once guys have lost fish by over tightning my drag settings to get the fish in quicker. Many times I have said soft drags allow the fish to do its thing and you can always give it more later one but once lost fish is always gone. Also lady anglers tend to play fish where guys tend to fight a fish, many times I say soft hands will land a fish where boxing gloves lose fish, an extra 10 mins playing a fish is all you need. The last day of Paul and Carol trip it was very windy over 25 mph but after an exciting trip found us in a natural mangrove creek where we had a fun day the joys off the Florida Keys boat fishing ever day no matter what the wind highlight of the day a near 10 lb Black Drum. Fantastic trip and hope to see you both very soon again. Well as the old A team used to say ” I love it when a plan comes together ” and the other day in Florida Bay it certainly did. 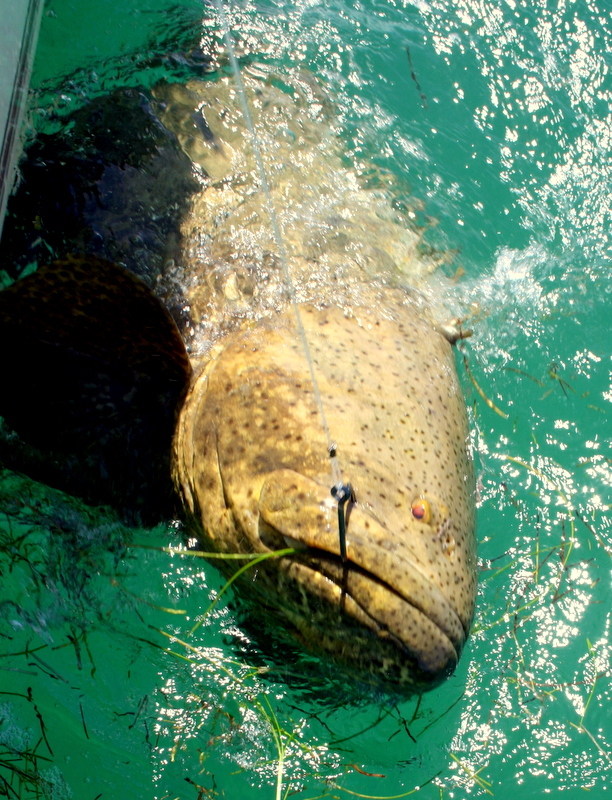 Paul had asked if we could have a day on the goliath grouper there is nothing like the sheer power these over 100 lb fish have as they just have to get back to the wreck. Well the day dawned fine and with little or no wind we soon covered the 20 miles to grouper wreck number one, wreck marked and anchor sett then heavy chum to get them to come to the boat and out of there lairs. We have been doing this way now for over 6 years and as it works as the say if it aint broke don’t fix it and boy does it work and with the fighting action the Whippy Walk drag and wind many a huge fish comes boat side. 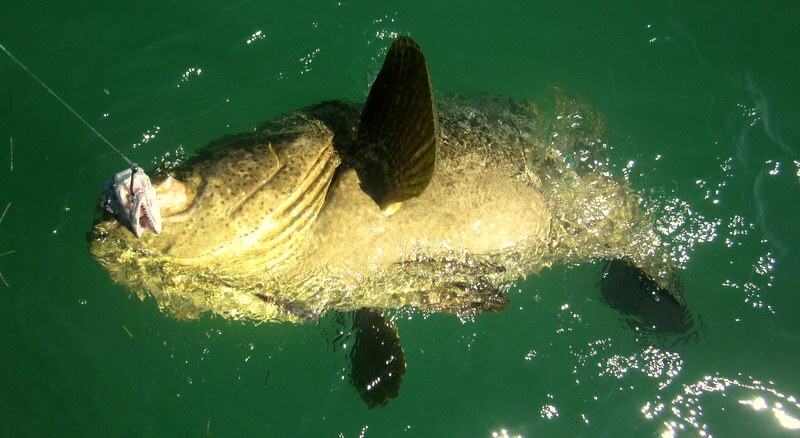 Soon we had our first fish about 200 lbs by the boat then started one of those magical moments what guys must dream about on a fishing holiday in the Florida Keys a grouper feeding frenzy. Soon we had fish feeding under the chum bag and takes right by the boat engines just jaw dropping in all Paul and Carol had six over 100 lbs with fish of 120, 150, 200, 200, 300, 350 then as they say they were done and I mean done. People often ask how I estimate size well for tarpon we don’t estimate we use very accurate tables on length and girth to give weights to about 2 lbs with grouper I had to come up with something else. Years ago before all this heath and safety rubbish cement was in 112 lb bags and over my life god knows how many I have had to lift but safe to say I know what a 112 lb dead lift is. 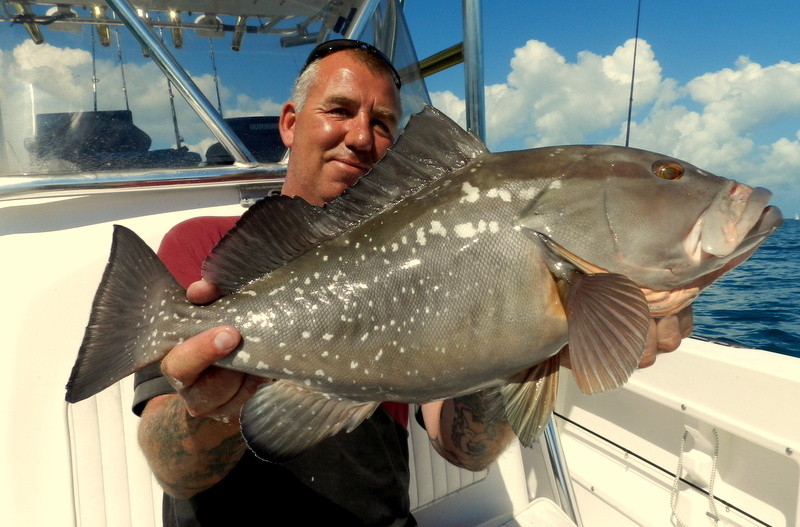 So with grouper boat side and 22/0 hook in corner of mouth 100 lb dead lift half-fish out off water 200 lb fish may not be super accurate but I think good for plus or minus 50 lb. So what a red-letter day 1320 lb of grouper and two very, very tired anglers that will teach Paul to ask for big grouper. Monster of the deep ! 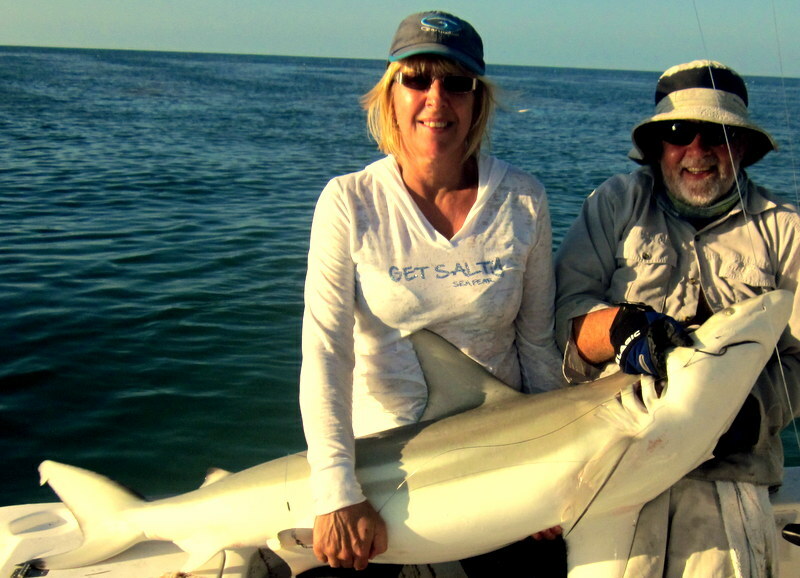 First I must say it is great to have Paul and Carol back not sure how many times over the years they have been but last year they were chasing things in the far east but the lure of the Florida Keys has them back again. What a mental first few days too much to get in one blog so an extra blog this week and lots of videos. 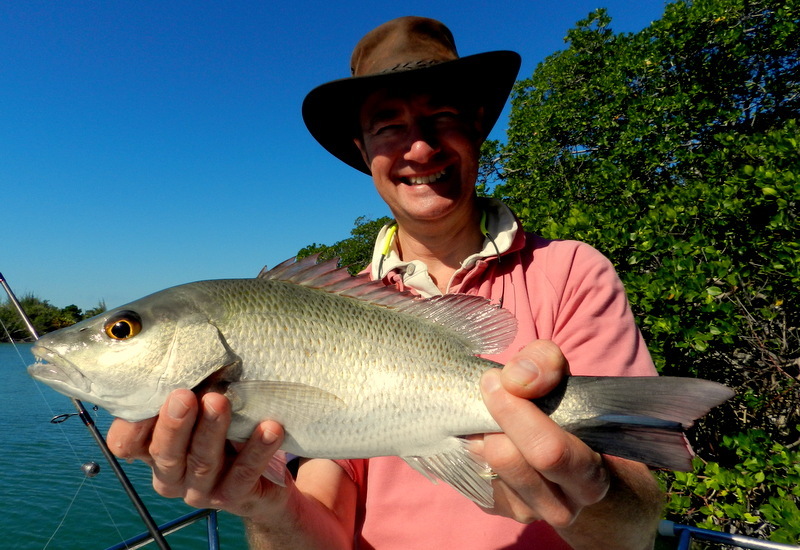 Day one was in the bay where at this time of year the mackerel are so much fun but we were plagued by snapper on our first stop but moved to a wreck where in short time Paul was connected to a goliath grouper but this time the fish won. 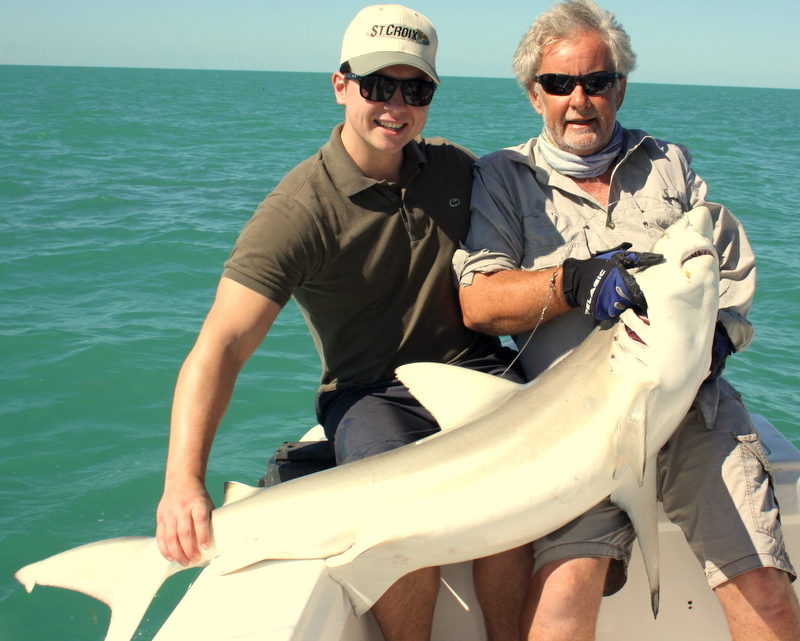 However Paul soon made up with a near 200 lb lemon shark which to say gave us a right run around but when you are connected to Paul it only ends one way. Day two was one of those forecast that tempts you wind lying down then a calm afternoon, well to me that means one thing tuna and silky shark. So off we go and wait out the for the calm on the reef having fun on a coral head in 40 ft of water, a stunning spanish hogfish for Carol mackerel and grouper for Paul then head south. Well not to be this time wind had gone but had left a 4 ft swell not nice when you have over 20 miles to go and with the boat speed down to just 20 we called the tuna off and went deep water wrecking in stead. What happened next sums up the Florida Keys to me, all anglers a bit down so the fish gods put a smile back on our faces. Paul had a small mutton snapper then the next fish turns into an unstoppable fish yes the big men in grey coats are here so big shark rod down. What happened next even after two days still very surreal, soon we had a fish on and it was giving a very good account of its self but Paul was, with a bit of give and take winning then bang and fish off but still a heavy weight on strange. 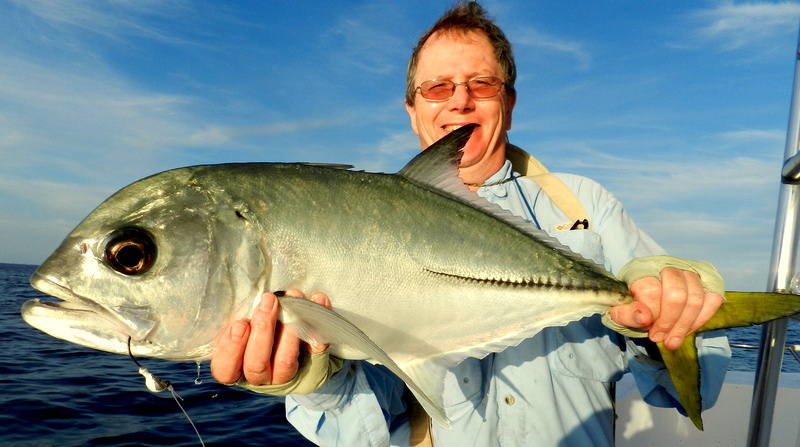 When Paul reeled in we all went into shock he had been connected not to a shark but a massive amber jack, they go over 80 lb here then on the way back something VERY AND I MEAN VERY big just bite it off only in the Florida Keys. Comments Off on Monster of the deep ! 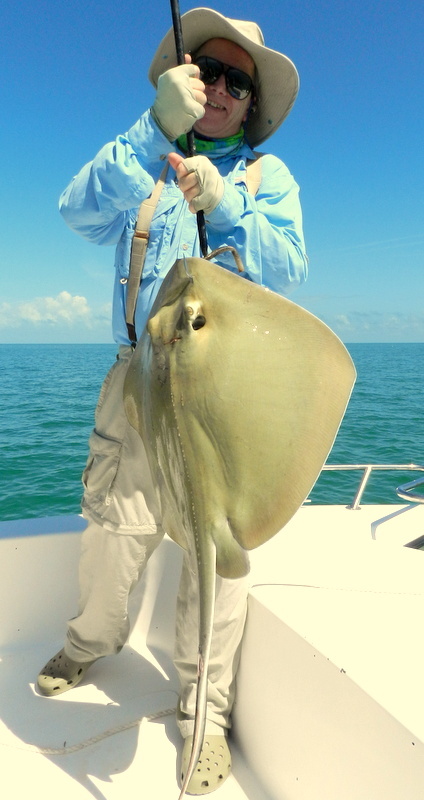 Two bits of good news from here in the Florida Keys all last weeks work on the boat was good. I had decided to upgrade the gauges to old school sweep arm analogue the old ones were LED read outs and in the bright sun light some times hard to read. It always surprised me even an hour with the RPM’s not matched big difference in fuel load as the twin tanks are not linked at all. Put a bigger live well pump in as temps rise the more water the better and replaced a seal in one engines lift motor just a tiny leak but it was beginning to bug me so job done and as they say boat just living up to Break Out Another Thousand . The other bit of good news is that we are seeing a few early tarpon in the 10 days the boat has been out, lots of work on the house as well, sea temps in the bay have gone from 64 after the cold front to the 74 we saw yesterday. A local guide went to seven mile bridge to give the tarpon a go and had a fantastic 2 for 4 as we say not the big 100 lb + but solid 60 to 80 lb wow I would take that any day. 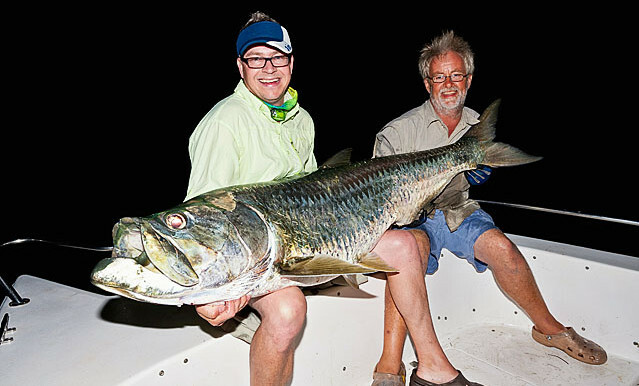 As I have said before the tarpon seem to be getting bigger but a three-hour fight does become a spectator sport for the other guys on the boat and you can normally get these smaller fish in and go back to catch an other. 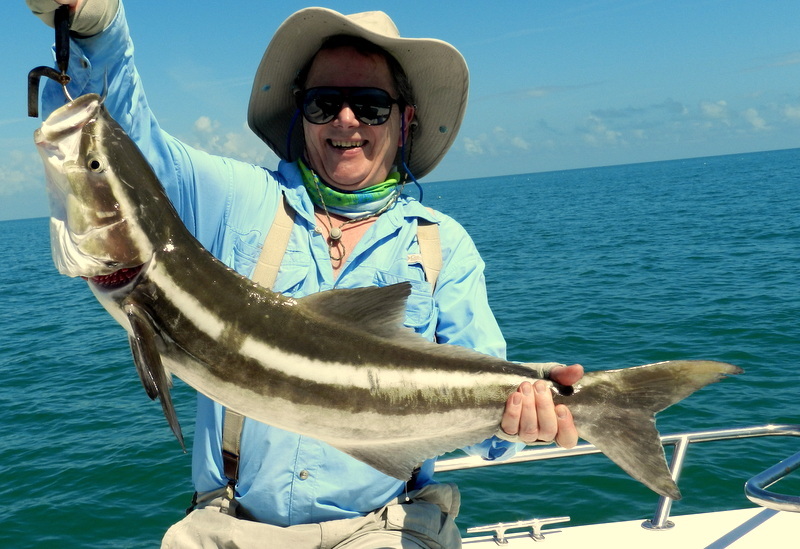 Had a very late cancellation yesterday from two anglers who were coming out on our special week to celebrate our doing fishing holidays in the Florida Keys for over ten years. We are charging the same price we did ten years ago just £ 85 a day for B + B and fishing and as it is getting late you might be able to even twist my arm a bit more. 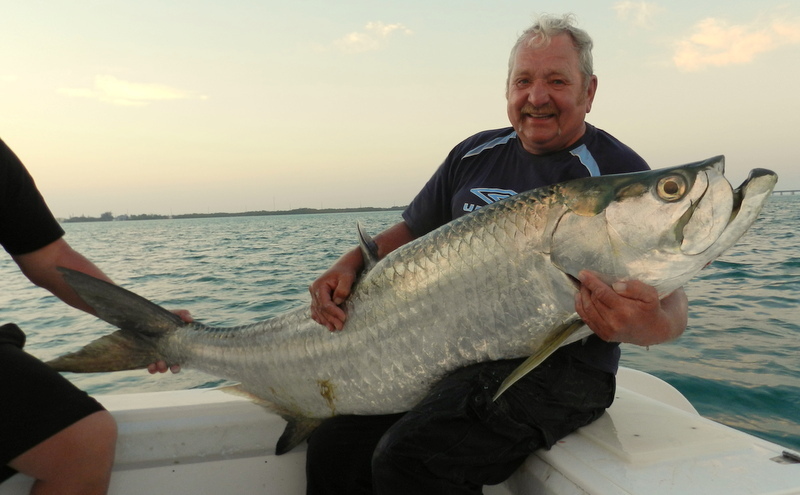 The dates are arrive 3 rd March and fish 6 days there will only be one other guy on the boat my oldest fishing buddy Martin who over 50 years ago got me in this mess and yes we will be catching Tarpon, so at our best price for years come and see what a 100 lb silver king is all about ! Comments Off on Early Tarpon ? Well as is normal on one of our fishing holidays in the Florida Keys Bill’s last day came all to quickly and the weather gods were not playing either a strong 20 + mph cool wind from the North. This means all our bay fishing is a no go and we either have to fish the bridges or tuck into the lee of the island and fish the south side close in. In all fairness I am very lucky here in the Keys compared to skipper friends in the UK who lose lots of days here we can boat fish ever day just fewer places to go when its windy. Well at the days planning meeting ( Helen’s famous Florida Fry ) Bill asked if we could go into the mangroves to show Patrick an other side to the Keys and as I have a system on the south side of the Island it would be very calm and out of the wind warm as well as it was going to be sun all day. Soon we had the snapper feeding and on light tackle fantastic fun, I have said before once you have lost the joy of catching small fish in my opinion you have lost a big part of fishing. However it was once again young Ash who put the thinking hat on and came up with a new method to catch snapper. 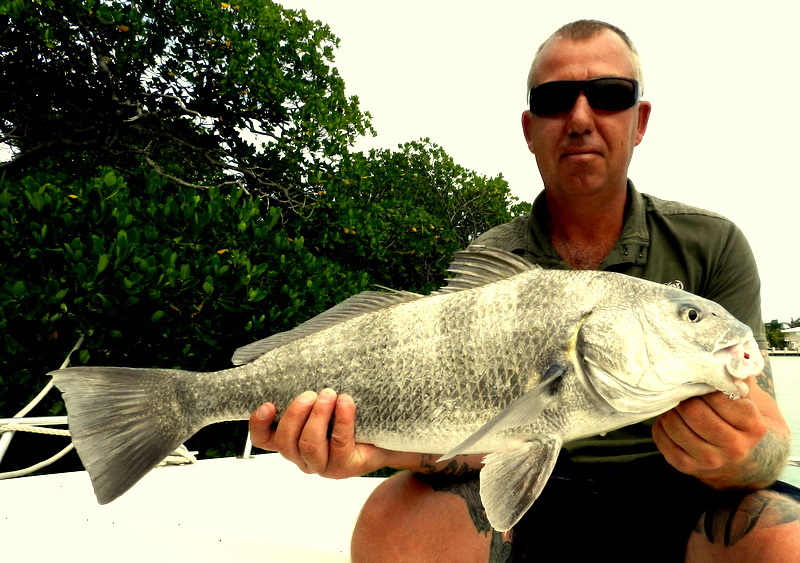 As it was very sunny the fish were under the mangroves and by using a large live shrimp on a fly line the bait would swim under the mangroves where some very good fish took them. Not for the purists this one but if you want a fun fish on a fly rod why not, no way cold any one cast a line that deep under the branches but a live shrimp did the work for you. So Bill had a very mixed week with the weather but fish to near 200 lb and a fantastic day on the tuna grounds I know many a party who would have paid extra, see you all again soon I hope maybe a little later in the year if you want heat.